A couple of years ago I owned a Rickenbacker 370 guitar. The model 370 is essentially a model 360 with an added middle pickup. I bought it new at my local dealer, Guitar Gallery. I’ve always liked Rickenbackers. I thought they were cool, unique, and well-made guitars. 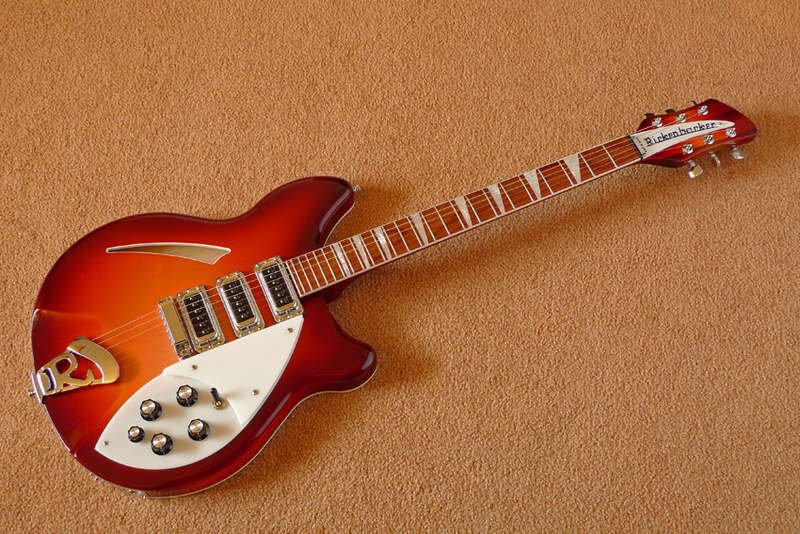 Although I always liked the Jetglo (black) finish guitars, this particular one was finished in Rickenbacker’s signature Fireglo color. A nice red to amber(ish)”sunburst”. It was a great playing and sounding guitar. Ricks are a little quirky in design and feel compared to more popular brands of electric guitars. The necks have a different feel and the rosewood fingerboard has the finish applied over it, as opposed to the unfinished rosewood of just about every other guitar out there. The frets on the 370 are the small vintage type. The pickups, especially the vintage “toaster” models, are generally bright sounding. All of these elements cause a lot of players to be put off by the guitar when first handled. Ricks take a little time to get used. That being said, they do have a strong, almost cult-like following. Ricks are known as “jangle” guitars, due mostly to their association with the Beatles and the Byrds and later bands such as REM and The Smiths. “Jangle” derives from a style of playing where the rhythm is played by picking individual notes of the chords (arpeggiated), as opposed to simply strumming. It is often played with a clean, compressed tone. It is more often the 12-string models which are used for this style because the extra octave strings add a high-end shimmer, although some players use the 6-string models to great effect. I like this type of playing and sound and as unique as the Rickenbacker was I still played the same type of music I play on any guitar. I’m not really a jangley player, I play bluesy. Although I may be inspired by a certain guitars tone to try something new, I usually end up playing blues. I can’t help it. It’s what I play. So one day I’m playing some blues in B minor on my Rick using a backing track that’s on YouTube. While playing I thought I would video my “performance” and post it in response to the backing track video with the title: “Blues Guitar in B minor…with a Rickenbacker!?”. I wasn’t entirely happy with my playing but I posted it anyhow to see what kind of feedback I would get. At first, not much. The video got only a few views in the first week. I thought, oh well, not too many fans of Ricks out there or even worse, my playing was so lame nobody bothered to watch much of it. After that first week though, things began to pick up. I started getting positive responses, not only for my playing, but even more for playing a Rickenbacker. Most people were excited that somebody was actually playing blues on a Rick! I never realized, or even thought about, that nobody really uses a Rick for blues. I searched the web but couldn’t find too many examples. A lot of the video responders said they never even thought that they could play blues on a Rick. The jangle thing is so ingrained in people’s heads when it comes to Ricks that even some Rick owners think they can’t play other styles on them! When the views on my video started to escalate I checked to see how viewers were finding it. Besides the usual keyword searches I discovered that my video was being linked from and embedded in forums and websites around the world. The discussions usually were centered around “CAN you play blues on a Rickenbacker?” and my video was being used as an example! I guess my answer was, YES!